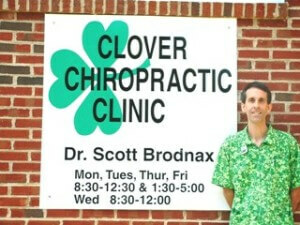 Dr. Scott Brodnax opened the Clover Chiropractic Clinic in May 1985 and has remained at the same location ever since, bringing Chiropractic care to multiple generations of families in Clover and the surrounding communities. This website is meant to be a brief introduction to the office and to Chiropractic. If you have any questions, please don’t hesitate to call and speak to Dr. Brodnax personally or for more information. Where does Health come from? Don't wait, contact us today to schedule a Spinal consultation. We'd love to fit you in for your first appointment!